The bride and groom kiss with a sun burst in the sky above them. 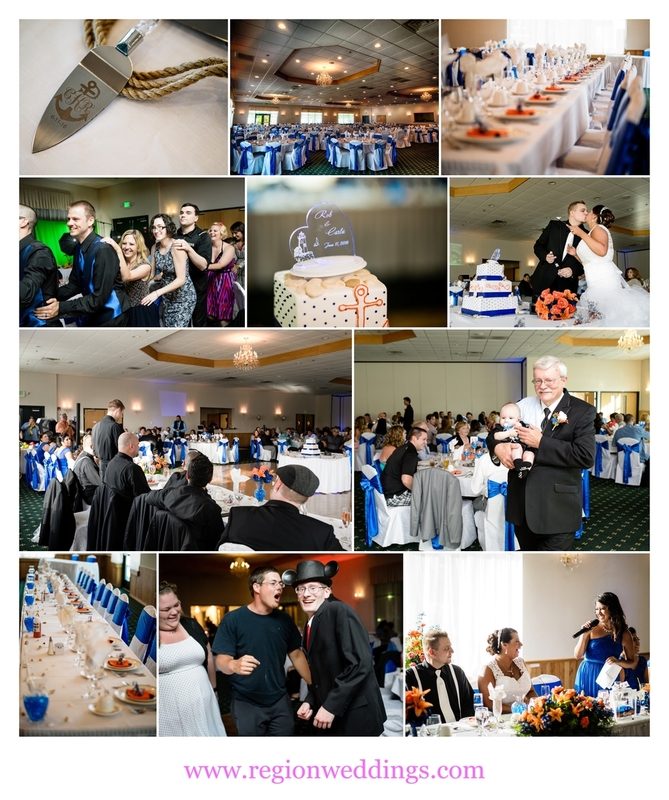 Carla and Rob had a wonderful, nautical themed summer wedding at The Patrician in Schererville, Indiana. It was a steamy 96 degrees, but they didn't let that keep them from their outdoor wedding in front of the gazebo. Temperatures were a lot cooler in the morning as the bridesmaids took over the bridal suite in the loft. 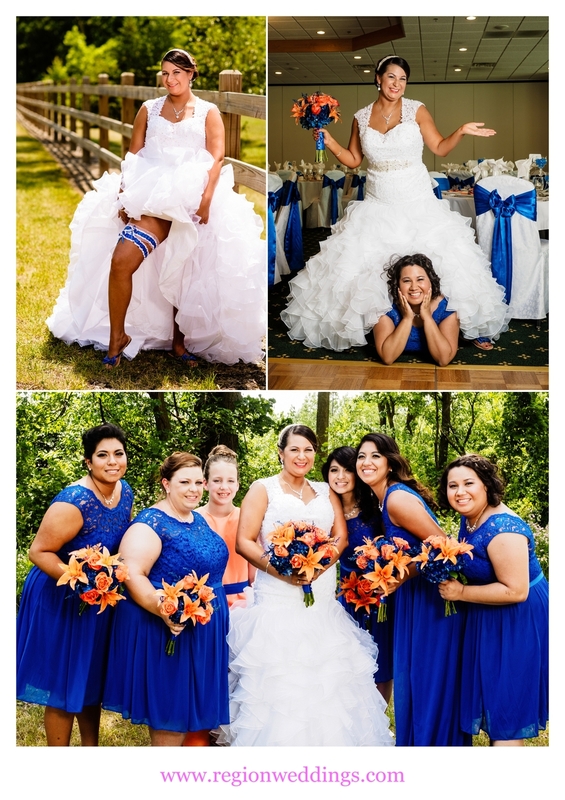 Carla's dominant blue wedding color showed off prominently in her garter and we used the twin as a prop for detail pictures. 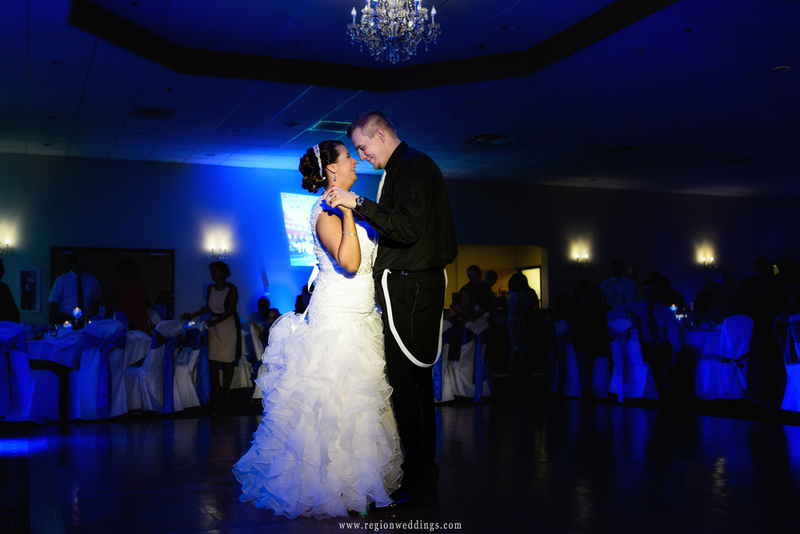 Images from the bridal suite at The Patrician Banquet Center. The bride leans against a rustic fence during her June wedding in Schererville. The bridesmaids blue dresses were stunning. They were a great bunch as I took them out in the heat for some fun wedding photos. Second photographer Kerrie and myself took the guys out next and then it was ceremony time. Bridesmaids in lovely blue dresses pose with the bride. Groomsmen walk along the path at The Patrician Banquet Center. Happy tears began falling as Carla and Rob were married underneath the bright, glowing sun. They poured sand to symbolize coming together and marched back inside the Patrician where we began family photos. Outdoor, June wedding ceremony at The Patrician Banquet Center. After some fun wedding party photos at the back gazebo, I whisked the bride and groom away for a little while and had them take a romantic stroll along the rustic fence and winding road. Since the sun was so bright in the sky, a romantic silhouette of the two of them seemed in order. Soon it would be time for introductions, dinner and dancing!! Romantic bride and groom summer wedding photos. Bride and groom take a romantic walk along a rustic, wooden fence. Wedding party photos at The Patrician Banquet Center. Rob's father carried out the couple's little boy during introductions and Carla and Rob cut their nautical themed wedding cake. Party time saw photo booth props hit the dance floor and a soul train plowed through The Patrician Diamond Room Ballroom. Summer wedding reception at The Patrician Banquet Hall. First dance at The Patrician during a June wedding. This has been a sneak peek look at Carla and Rob's summer wedding at The Patrician in Schererville, Indiana. Be sure to follow the social media links below for more updates. As always, to inquire about your own wedding date, please fill out the Contact Form.